In this presentation, Peter Soetens and Ruben Smits introduce the audience to todays Open Source robotics eco-system. Which are the strong and weak points of existing software ? Which work seamlessly together, and on which operating systems (Windows, Linux, VxWorks,... ) ? We will prove our statements with practical examples from both academic and industrial use cases. This presentation is the result of the long standing experience of the presenters with a open source technologies in robotics applications and will offer the audience leads and insights to further explore this realm. 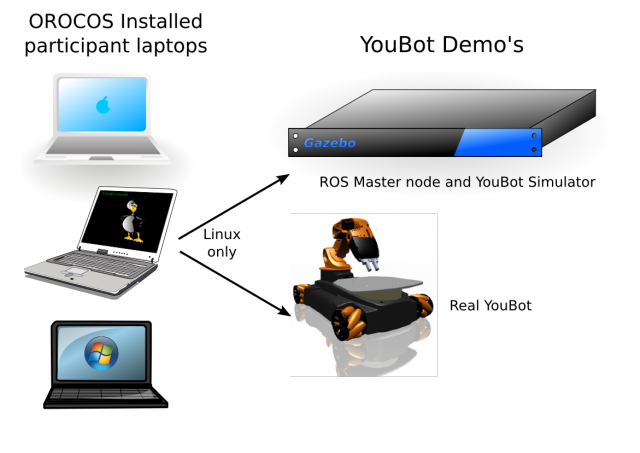 YouBot Demo Setup The workshop will start with making you familiar with the Orocos Toolchain, which does not require the YouBot. The hands-on will continue then on a robot in simulation and on the real hardware. We will use the ROS communication protocol to send instructions to the simulator (Gazebo) or the YouBot. Installing Gazebo is not required, since this simulation will run on a dedicated machine. 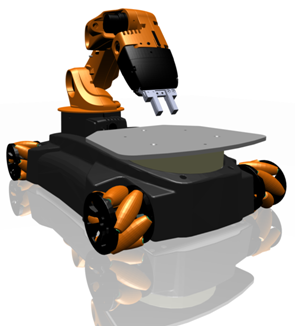 Documentation on the workshop application and the assignment can be found at https://github.com/bellenss/euRobotics_orocos_ws/wiki. You first need to register for attending the euRobotics Forum. Registration for the workshop is mandatory, but free of charge. For the hands-on session, we will limit the number of participants to 20. The workshop is guided by 6 experienced Orocos users. Please register your participation by sending an email to info at intermodalics dot eu. We will confirm your participation with a short notice. Later-on, you will receive a second email with more details about how to prepare. You should receive this second, detailed email in the week of March, 20, 2011. The installation instructions depend on if you have ROS installed or not. NOTE: ROS is required to participate in the YouBot demo. Install Diamondback ROS using Debian packages for Ubuntu Lucid (10.04) and Maverick (10.10) or the ROS install scripts, in case you don't run Ubuntu. Install the ros-diamondback-orocos-toolchain-ros debian package version 0.3.1 or later: apt-get install ros-diamondback-orocos-toolchain-ros After this step, proceed to Section 2: Workshop Sources below. We did not succeed in releasing the Diamondback 0.3.0 binary packages for your target of the Orocos Toolchain. This means that you need to build this 'stack' yourself with 'rosmake', after you installed ROS (See http://www.ros.org/wiki/diamondback/Installation). This 'rosmake' step may take about 30 minutes to an hour, depending on your laptop. NOTE: setting the ROS_PACKAGE_PATH is mandatory for each shell that will be used. It's a good idea to add the export ROS_PACKAGE_PATH line above to your .bashrc file (or equivalent)..
Run the bootstrap.sh (version 2.3.1) script in an empty directory. An additional package is being prepared that will contain the workshop files. See euRobotics Workshop Sources. Due to a dynamic library issue in the current 2.3 release series, Mac OS-X can not be supported during the Workshop. We will make available a bootable USB stick which contains a pre-installed Ubuntu environment containing all necessary packages. Windows users can participate in the first part of the hands-on where Orocos components are created and used. Pay attention that installing the Orocos Toolchain on Win32 platforms may take a full day in case you are not familiar with CMake, compiling Boost or any other dependency of the RTT and OCL. See the Compiling on Windows with Visual Studio wiki page for instructions. The TAO/Corba part is not required to participate in the workshop. You need to follow the instructions for RTT/OCL v2.3.1 or newer, which you can download from the Orocos Toolchain page. We recommend to build for Release. In case you have no time nor the experience to set this up, we provide bootable USB sticks that contain Ubuntu Linux with all workshop files. An additional package is being prepared that will contain the workshop files. See euRobotics Workshop Sources for downloading the sources. Windows users might also install the Kst program which is a KDE plot program that also runs on Linux. We provided a .kst file for plotting the workshop data. See the Kst download page. You repeat the classical CMake steps with this package, generate the Solution file and build and install it. Then start up the deployer with the deployer-win32.exe program and type 'ls'. It should start and show meaningful information. If you see strange characters in the output, you need to turn of the colors with the '.nocolors' command at the Deployer's prompt. The euRobotics Forum workshop on Orocos has been a great success. About 30 people attended and participated in the hands-on workshop. The Real-Time & Open Source in Robotics track drew more than 60 people. Both tracks were overbooked. Since the sources are still evolving, it might be necessary to update your version before the workshop. The first, ROS-independent part, uses the classical hello-world examples from the rtt-exercises package. Or you can download the examples from here. You need at least version 2.3.1 of the exercises. If you're not using ROS, you can download/unzip it in another directory than ~/ros. Check that ~/ros is in your ROS_PACKAGE_PATH environment variable at all times, by also adding the export line above to your .bashrc file. Here are some instructions to see if you're running a system usable for the workshop.